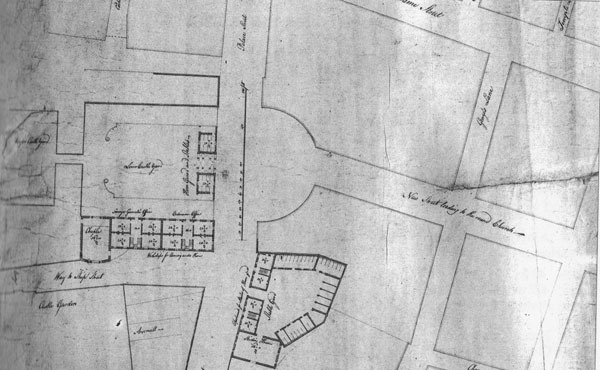 Unbuilt plan by the Wide Streets Commissioners for a new ceremonial entrance to the Lower Yard of Dublin Castle and street to the “round church” – St. Andrew’s. The entrance at the Lower Yard included a sweep or crescent of buildings facing into the castle. Like the proposal for Bedford Square in the mid 18th century, no progress other than preliminary design work was completed. St. Andrew’s was rebuilt in 1670 to a circular plan, and later rebuilt again in the 19th century in a Gothic style by Lanyon, Lynn and Lanyon.